I so much wanted this project to work out. Though the adorable baby model is hard to ignore, I think the sweater and hat are very cute on their own. My choice of yarn, however, was disastrous. Elann.com Lara, which I’ve used once before (in a supporting role), would be wonderful for a summer tank, or a flowing scarf. It is slinky, silky, and drapey. 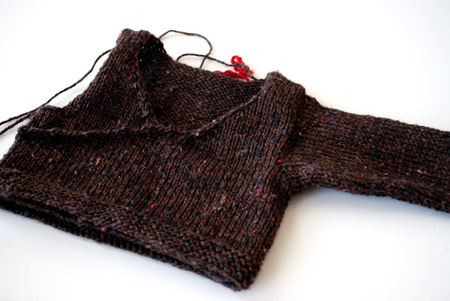 It is not substantive, stretch-proof, or immune to snags: a good baby sweater it does not make. In addition, the pattern is written… awkwardly. That’s the best word, I think. Along the lines of Debbie Bliss patterns, if you know what I mean: hats knitted flat, many small pieces where there could have been only one, and weirdly-placed seams where it would have been simpler to just make two separate pieces. I don’t think it’s without hope, but I know if I were to knit this again, I’d alter how the whole thing is constructed. Anyway, why speak ill of the dead? Instead, let’s talk about a much-needed upgrade. I was so bummed by this Tugboat coat not working out, and a bunch of other misbehaving knits, that I wanted to knit a “sure thing” next. See, this one has a cute baby, too! 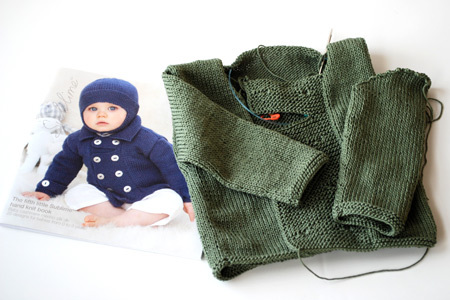 Though I’ve leafed through Natural Knits for Babies and Moms before, it caught my attention recently when Danielle knit the Harvey Kimono for Elinor’s baby, Odysseus. Elinor nonchalantly mentioned, “He wears this a lot because it is so easy to get on and off,” and that was the “sure thing” moment for me. Now that I’ve given the book a second look, I actually like it quite a bit. It has a lot of true basics: very simple pullovers, cardigans, vests, dresses, booties, and hats, in sizes from newborn to 12 months. They are not embellished, overly complicated, and are constructed in a straightforward way. I think such patterns are good to have in one’s knitting arsenal: sometimes it’s tricky (and annoying) to add all those “extras” when the whole sweater is, like, the size on an index card :). Another thing that really piqued my curiosity in this book is that the majority of the projects, including the Harvey Kimono, are knit using Green Mountain Spinnery Cotton Comfort (80% wool/20% organic cotton, 180 yards/2 oz. skein). What is this yarn, and why is it used so much? Have you tried it? I had to find out. I bought two skeins in a Ravelry destash, in the Maize colorway. At first appearance the yarn looks and feels a little crunchy and nubbly, almost like Rowan’s Summer Tweed. I haven’t tried knitting with it yet, but I’m definitely looking forward to it! I’ll let you know what’s so special about it :). For this Harvey Kimono, though, I’m using another “sure thing”: Kraemer Yarns Tatamy Tweed DK in Walnut. I first learned about this yarn from bestitched Diana, who’s used it for items big and small, always with resounding success. In fact, this very skein came to me from the bestitched stash itself. Its claim to fame: one of the few non-wool tweed yarns on the market, and it’s very hardy in wearing and machine washing and drying. I don’t know why it took me so long to try this yarn! It’s lovely all around: pretty to look at, behaves on the needles, and makes a great knitted fabric. 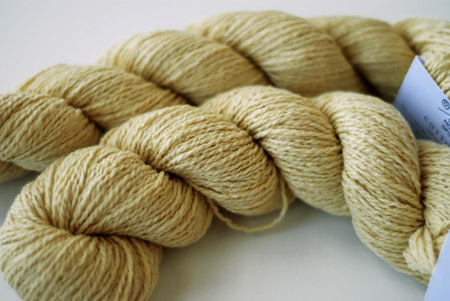 It’s not overly drapey, nor particularly stiff, and in many ways resembles the look and feel of wool blends. On top of that, my knitting gauge using this yarn matches that of the Harvey Kimono pattern, so I’ve had to make no modifications to the pattern at all. Another “sure thing,” contributing to this project’s success. A sigh of relief – I was due a little break! I just finished a baby set in this yarn myself,and couldn’t agree more. It’s a great yarn for little ones, cheap, and good variety of colors as well! 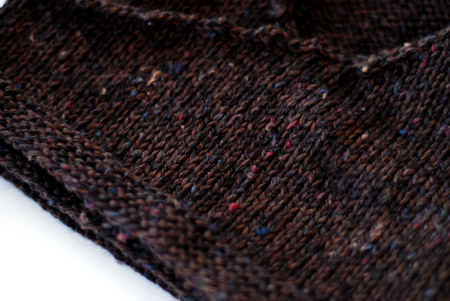 I’ve been leafing through baby knits…and practicality is one of my biggest complaints. The Harvey Kimono looks easy to wear for a baby…no small head holes without button closures or crazy ties and ribbons. I better put this one on the list. I can’t wait to see what you think of the cotton comfort, I bet it softens after washing. I keep waiting for some sort of announcement…. Wow, I’ve been struggling with a couple weeks of knits not working too. So I’ve searched for a few things that have been long unfinished. Finished a few and now hope the karma will be better now that a few things have become successful FOs! I have done the Harvey Kimono sweater. It is really cute, I just found the whole 107 stitch pickup or whatever around the edge a bit of a challenge. I will look for your yarn from this project! Thank you! I just started a Baby Owl Vest with the Tatamy Tweed (in Walnut!) on Friday. I’m really pleased to hear that you think it makes a great yarn for baby outfits, because so far, my research hadn’t turned up many projects for babies which used it. Tatamy Tweed is the BEST YARN evah. That is all. I recently had a run in with a fiddly for no reason pattern myself. It took me four months to finish the silly sweater because I hated the pattern so much. Finally sewed up the last seam today. I’ve looked at that book at lot but have never brought it home with me. I guess I need to look again. I’m interested in what you think of the Green Mountain yarn – I’m always looking for a good wool/cotton. Great yarns! Now wouldn’t that be a wonderfully helpful book? Looks like a nice pattern also. Some sure work better than others, and it looks like you’ve discovered a winner for me to check out! Thx. Now you have me intrigued to try this Tatamy Tweed. I can’t believe how many colors it comes in! I am making my first project from a cotton-acrylic blend (Lion Brand Cotton-Ease), which has a more limited palette, but I love the colors I found, and the feel is really soft. My boy is badly wool-allergic, so I am open to trying non-wool blends that actually give me some of the color range, depth and texture of wool. Tatamy Tweed looks to have all of these. Glad you’re getting a knitting “break” with that beautiful tweedy brown yarn. I love it. Very nice. I have been thinking about trying that yarn, though I tend to gravitate to the woolies. I’ve used Cotton Comfort, and while it has a nice hand I found that my projects stretched out of shape pretty quickly. I need to wash one of my projects out of this yarn again and see if it will reblock well this time. I love Spud and Chloe yarn for babies. It is 55% wool and 45% cotton, and very soft. Better still, it is machine washable and dryable. It comes in 3 weights and they have cute patterns! Sorry that the first sweater didn’t work out. I love Debbie Bliss patterns, but not how they were written. Kimono is a great choice for baby. Lovely sweater, but I wonder why Baby is barefoot in a warm sweater…. Now THAT’s a kimono worth its salt — the Walnut color and tweedy texture have a real bite to it — nothing namby-pamby about this sweater (guess you can tell I’m not a pastel girl). I think I might actually knit one of these now! That tweed looks so delicious. Never used it but it’s nice to find out about these yarns. You’ve also reminded me of this thing I have for maize-colored yarns. More in the stash than I realized. Very intrigued by the Tatamy Tweed now. I’ll have to check it out. Oh hey, and while that kimono IS easy to get on and off, it’s not a deal breaker. While the chubster has outgrown the vest you made him, he wears the blue/white/brown striped sweater in rotation with the kimono and others too! I don’t mean to leave you with the impression that a standard cardi is less useful – because it’s not. I might check out those two yarns. I have to summer babies to knit for and I want them to have something that’s not wool (*gasp*). Or at least, shall we say, pre-wool. Cotton Comfort was written up in Interweave Knit’s Spring issue (in a review of cotton yarns, mostly organic). The writer called it out as “a good way to introduce wool into baby’s wardrobe”. I’m looking forward to trying it out myself!